In 2014, Dan teamed with Nashville country recording artist, Garrett Steele, landing in the 6th overall position nationally on the Crappie Masters Trail. Their team, Crappie Country, is booked on radio and television along their tour to promote Garrett’s music, share fishing tips and techniques and introduce their many national & regional sponsors to audiences across North America. The team has been labeled the “Ambassadors of Crappie Fishing”. 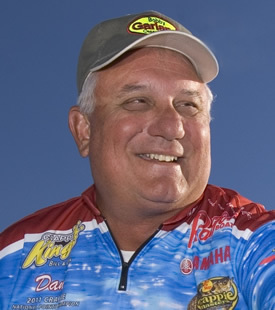 Dan is also now taking his promotional and educational skills nationally by presenting, teaching and training at numerous outdoor shows, writers camps and retail outlets such as Bass Pro Shops. Dan is a very accomplished veteran Bass and now Crappie Fisherman on the National scene, recently winning the Crappie Masters Angler of the Year Team honors for both 2011 and 2012. Even more than a fisherman, Dan is a PR/Marketing/Online Magazine Publisher/Business Owner. He is very accomplished in numerous areas. Will finish the year published in several state Game and Fish Magazines, Field and Stream, CrappieMasters Magazine, CrappieNow, Gary Yamamoto On-Line Magazine, Fishound, Crappie.com, Montgomery Advertiser, Wetumpka Herald, Pittsburg Gazette, Pottsmith Mercury Magazine and news website, Crappie Angler Magazine, In Fisherman Magazine, Elmore County Living Magazine and so many more to come. Talent on Don Days Venture Outdoors Crappie Fishing on the Alabama River. Regional Show in the Southeast. The show is also viewable on line via their website. Numerous TV morning shows around the nation while fishing the tour in 2015. Fished 15 National tournaments in 6 states in 2012, 10 in 5 states in 2013 – two fourth, one 8th and one 12th place finishes in 2013 to date, and 11 in 8 states in 2014 finishing 6th overall.